Named after Peter Pallas who first described it, Pallas Cat or Pallas's Cat is a Central Asian feline of astonishing beauty. About the size of a large domestic cat, it is two feet long with a tail that can grow up to a foot. Weight is around ten pounds on average. Resembling the Lynx in facial appearance, Pallas Cat is believed by some to be the oldest living species of cats, its evolution dating as far back as ten million years. Fur is long, thick and grayish in color, often varying with season. Head is short and broad and face is flattened. Ears are small and widely set. Body appears to be heavy and supported on stocky limbs. Eyes are large and pupils circular unlike those of other small cats. Its lustrous coat and physical appearance led to the initial hypothesis that the Pallas Cat was the ancestor of Persian Cats, a theory now known to be incorrect. Hair are white tipped, giving the cat a frosted snowy appearance. Several dark spots and stripes exist on head and body. A solitary and crepuscular hunter, Pallas Cat takes small animals usually including rodents, insects and birds. It uses either the stalk and ambush approach characteristic of most felines or directly attacks dens and burrows of small animals where it either waits outside them for the prey to appear or attempts to paw them out. It is often seen resting inside burrows of other animals as well. Suited for a cold habitat Pallas Cat, Otocolobus Manul, resides in the snowy mountains and harsh plains of Central Asia. It inhabits a number of countries in that region and is divided into the following subspecies based on its geographical distribution. Pallas Cat, also known as Manul, comes into estrus early in the year and gives birth to a big litter of up to six kittens after a pregnancy lasting around ten weeks. Maturity is reached at one year of age. Lifespan of up to twelve years has been recorded in captivity. Hunted in the past for its lustrous cat, Pallas Cat is now protected as a species in most countries. Still it suffers from depletion of its prey base through poisoning of rodents that are believed to be pests for the fields. The poison also kills the cats, as does the disease toxoplasmosis to which this beautiful cat is particularly vulnerable. Current classification, however, still remains Not Threatened. 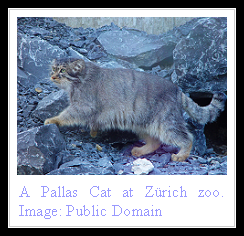 What is the Pallas Cat's changes of appearence over time? Pleased to announed that at a place called Wildlife Heritage Foundation they pallas cat's have just given birth to (they beleive) four kittens. Over the moon and cannot wait to view them. It is really helpful !An opportunity to read a fantastic and imaginary blogs.It gives me lots of pleasure and interest.